Lock in a great price for Nice Excelsior Centre ville – rated 8.3 by recent guests! The location is fantastic, the place is cute and there are free gummies at the reception. When I arrived too early, I was able to leave my luggage and go and explore the town while I waited for check in. It was super clean, great staff, great location !!! Overall it felt like home! Love the atmosphere and style it felt comfortable and welcoming. We both liked This place a lot. The cleaning woman did a great job and was very accommodating with getting us more towels and pillows. The bathroom shower is hard to work without getting water all over the floor. The doors don’t really work to keep it from overflowing out. Super comfy bed! We really enjoyed our stay here. We arrived late in the evening and were warmly welcomed by a very good English speaking staff member who was proud of the hotel and its history. Breakfast staff were so friendly and we really enjoyed fuelling up for a day's travelling and exploring. The location is very convenient (very close to train station). It’s also walkable distance to the beach / old town/ shopping avenue. In January weather it was comfortable / warm for us to walk outdoor so the distance from the beach (as some might argue to be far) was not a problem. 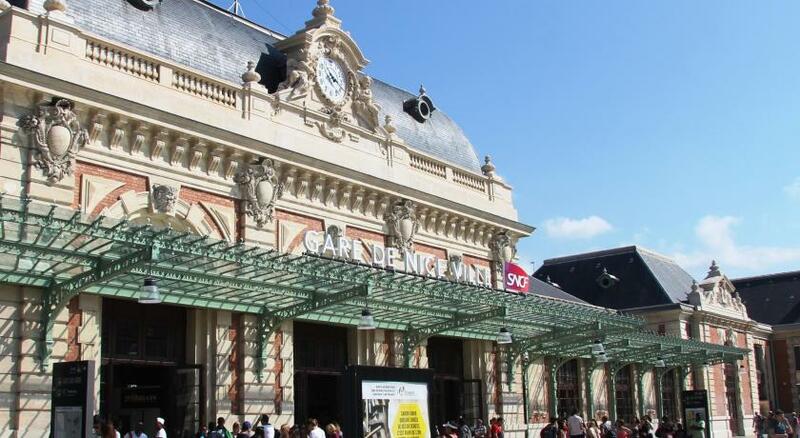 We took buses to visit other Reviera cities and the hotel being close to the train station makes it extra convenient when we wanted to take a faster ride back using the train. We enjoyed the breakfast although there was a misunderstanding about whether breakfast was included in our price. We were advised to go for breakfast every day only to be charged at the end. However breakfast was delicious. Room was clean and spacious for 3 adults. Elevator was tiny so it makes it hard to fit us all with luggages, but we managed. Staff was very friendly and couldn’t be happier for the suggestion to visit Saint Paul de Vence. Good location, near train station. Delicious breakfast. Helpful staff. It was quiet and comfortable. I liked the breakfast and the staff was very helpful. 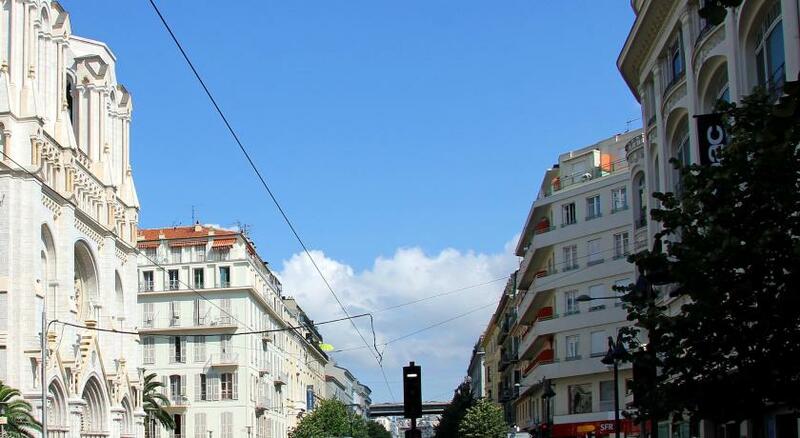 The location is super convenient, 2 mins away from Nice ville train station - perfect for day trips to neighbouring cities. Great hotel. 10 minutes walk from the beach. The staff is very friendly and helpful. The bed was super comfortable. 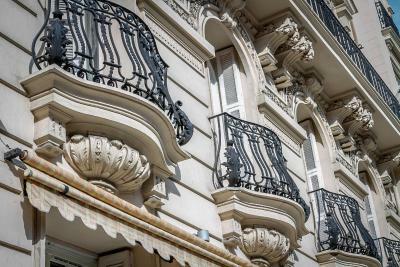 This boutique hotel is located in the heart of the musician’s quarter of Nice, 3,100 feet from the famous Promenade des Anglais. Nice Excelsior Center Ville offers a 24-hour reception, free WiFi and a quiet garden with summer bar. Guests can also enjoy the cozy reception area with a large selection of travel books. 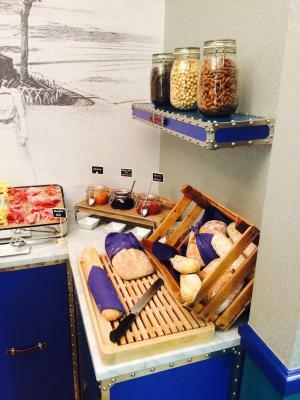 A breakfast of fresh products and hot or cold drinks can be served to the guest rooms or in the breakfast lounge as a buffet. The decor of each room is inspired by travel and the French Riviera, with travel trunks, drawings and rich colors. Each room features a flat-screen TV with multilingual channels, air conditioning, and a private bathroom with free toiletries. 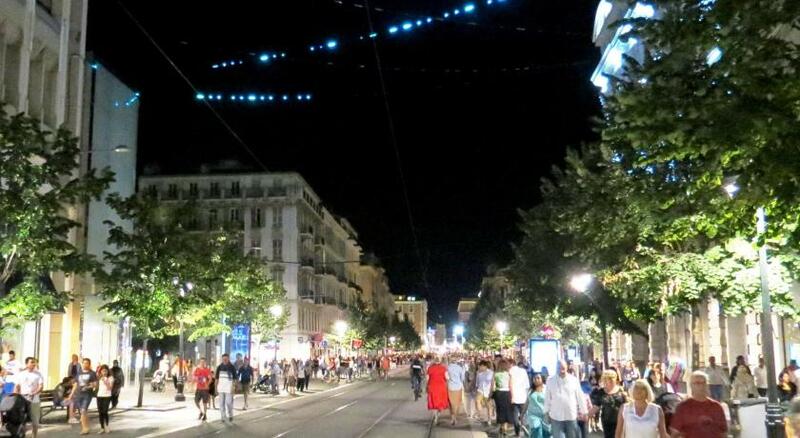 Nice-Ville Train Station is 500 feet from the hotel and the central shopping street, Avenue Jean Médecin, is a 3-minute walk away. When would you like to stay at Nice Excelsior Centre ville? This more spacious room offers garden views and features a flat-screen TV with cable channels, air conditioning, a desk and free WiFi access. The private bathroom includes a hairdryer and free toiletries. This air-conditioned room features a flat-screen TV with cable channels, a desk and free Wi-Fi access. The private bathroom has a hairdryer and free toiletries. This air-conditioned room features a flat-screen TV with cable channels, a tea/coffee maker, a desk and free Wi-Fi access. The private bathroom includes a hairdryer and free toiletries. An extra guest can be accommodated in this room for a fee. These 25-m² Junior Suites feature a seating area and garden views. Each room also offers an LCD TV, safe, mini-bar and tea and coffee making facilities. A third and fourth bed may be added if required. Rooms are available with double or twin beds. A buffet breakfast is available between 7:00 and 10:30. 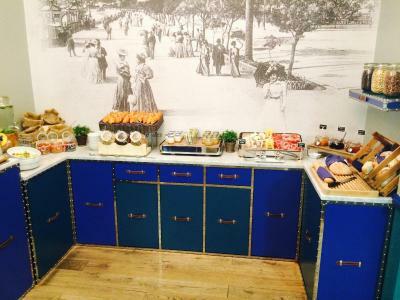 Breakfast can be served in your room for an additional charge. 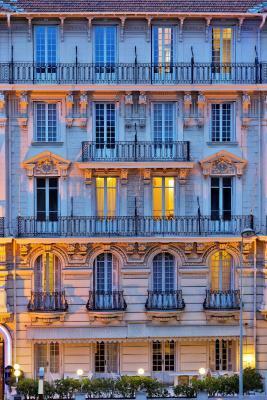 Welcome to the Nice Excelsior hotel, located in the city centre next to Nice central train station. Our charming hotel offers 42 Comfortable rooms view over the garden or the city. Rooms are equipped with flat screen, wifi, tea and coffee service on request and private bathroom. You may enjoy your breakfast in a nicely decorated dining room and take refreshment during the summer in our patio Excel Bar. All our team will be delighted to take care of you during your stay. House Rules Nice Excelsior Centre ville takes special requests – add in the next step! Nice Excelsior Centre ville accepts these cards and reserves the right to temporarily hold an amount prior to arrival. For bookings of 6 rooms or more, different policies will apply. Please contact the property after booking for more details. The room was comfortable, the breakfast had fresh orange juice, and is was walking distance to the places of interest. Small rooms. The breakfast wasn’t nice and the food was not covered, so I found ants in the milk. You feel that it’s not fresh. As a result, I didn’t have breakfast while I’m paying for it. The toilet area in our room was tiny and not at all like four star hotel standard. This did not make for a very relaxing stay. Staff were obliging but unfortunately we could not be moved to another room on the first night. We did not request a change of room on the second night as our friend travelling solo was located near us. Staff were obliging. The court yard garden was attractive. The aromas from the breakfasts were very tempting ! Great location. Breakfast varied enough. Room quiet. Not enough tea or coffee in room. Noisy on night time, odd smell in the room , little space for clothes. Good and quiet location near the train station and the tourist information office. They clean the room every day. Very good breakfast and service. People at the reception are more than helpful. You can also store your luggage after checking out for free, if your flight is hours ahead. Proximity of venue to best of Nice and the helpfulness of staff. Great breakfast. Very helpful staff. Black out curtains to block out the sunshine! Booked a taxi for our departure. Lovely comfy bed. The rooms were quite tiny and I could have done with a herbal tea option instead of black tea only. Very friendly welcome from gent in reception. 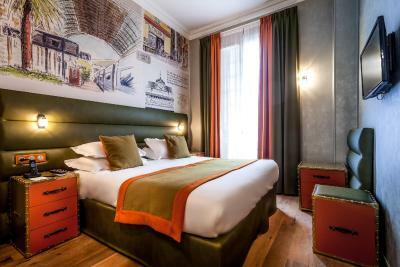 Stylish quirky hotel in top location for the train station.